1¢ dull purple on buff, N.B.N.Co. envelope essay, rich color and crisp impression, entire fresh and pristine, Extremely Fine, one of the rarest of these essays designs (Thorp 51g). Undersander No. E35Ag Estimate $4,000 - 6,000. AN EXTRAORDINARILY RARE EXAMPLE OF THE N.B.N.CO. 1869 1¢ PICTORIAL ESSAY ENTIRE IN PURPLE - ONLY ONE OTHER EXAMPLE IS KNOWN TO EXIST. 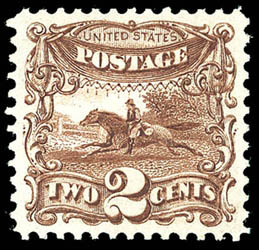 1869, 2¢ brown, o.g., barest trace of hinge (appears never hinged), virtually perfect centering amid uncommonly large and beautifully balanced margins, beautiful rich vibrant color and remarkable Post Office freshness, an Extremely Fine to Superb gem, with only five examples to grade as such with only three examples higher; with 2015 P.F. certificate and 2015 P.S.E. certificate, both Graded (XF-Sup 95, SMQ $3,000). 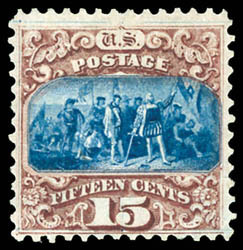 A TRULY AMAZING MINT EXAMPLE OF THE 1869 2¢ PICTORIAL ISSUE IN PRISTINE CONDITION. 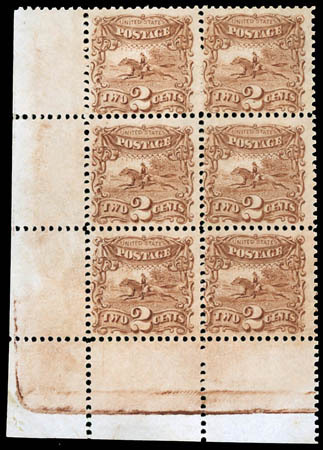 1869, 2¢ brown, bottom left corner margin block of 6, slightly mottled o.g., strong bright color, slight plate wash showing impression of plate edge in bottom margin, F.-V.F., an attractive and scarce position multiple. Scott No. 113 $4,850 for block and two singles. 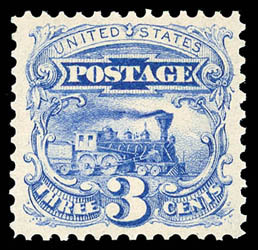 1869, 3¢ ultramarine, o.g., never hinged, perfectly centered amid beautifully balanced margins, radiant color and a bold detailed impression in bright fresh paper, an Extremely Fine gem; with 2015 P.F. Graded certificate (XF 90XQ, SMQ $1,600 for 90). Scott No. 114 $250 for hinged. A WONDERFULLY CHOICE NEVER HINGED EXAMPLE OF THE 1869 3¢ PICTORIAL ISSUE. 1869, 10¢ yellow, exceedingly well centered with vibrant color, bold strike of Nagasaki "N" fancy cancel (Frajola NAG-Can4), fresh and Extremely Fine; with 2015 P.F. certificate. Scott No. 116 Estimate $2,000 - 3,000. 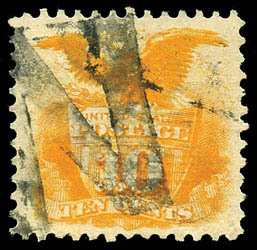 A CHOICE STRIKE OF THE NAGASAKI "N" CANCEL, ONE OF ONLY A HANDFUL KNOWN ON THE 1869 ISSUE. 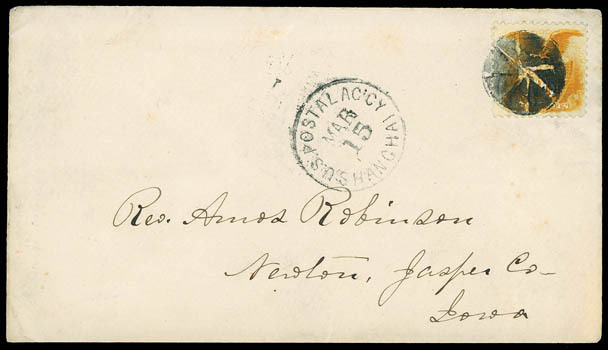 There is only one recorded 1869 Issue cover with this cancellation that was offered in the Coulter sale, realizing $41,250. 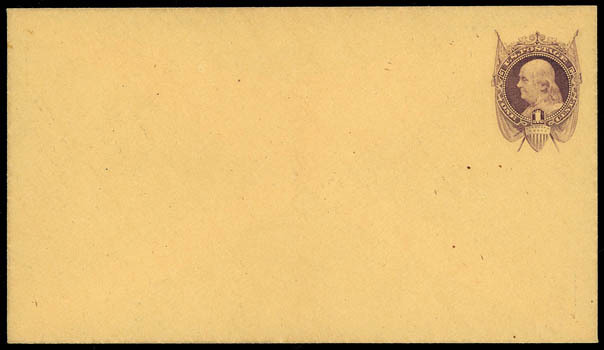 1869, 10¢ yellow, deep rich color, tied by bold strike of circle of wedges on clean 1872 cover to Newton, Iowa, full strike of matching "U.S. Postal Ag'cy, Shanghai, Mar 15" cds (Frajola type SHA-Pmk2), reverse with "San Francisco Cal Apr 19" cds, Extremely Fine. A REMARKABLY CHOICE USE OF THE 10¢ 1869 ISSUE FROM THE U.S. POSTAL AGENCY AT SHANGHAI. This was carried on PMSS branch line steamer "Oregonian" from Shanghai Mar. 15th to Yokohama arriving Mar. 22nd. Then carried on the PMSS steamer "America" from Yokohama Mar. 26th to San Francisco arriving Apr. 18th. 1869, 15¢ Landing of Columbus essay, type I, small numerals, in green, complete die on India, die sunk on card (77 x 68mm), with N.B.N.Co. imprint below design, rich color, fresh and pristine, Extremely Fine, this essay is among the rarest of all 1869 Pictorial essays (formerly Scott #118-E1c). Brazer No. 118E-Ca. 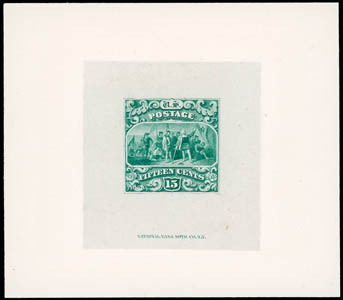 THE UNIQUE 1869 15¢ COMPLETE DESIGN TYPE I SMALL NUMERAL ESSAY IN GREEN. 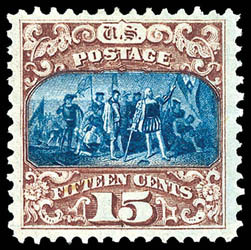 1869, 15¢ brown & blue, type I, full o.g., fresh mint example on bright paper, with both colors rich and vibrant, F.-V.F. and attractive; with 1974 P.F. certificate. 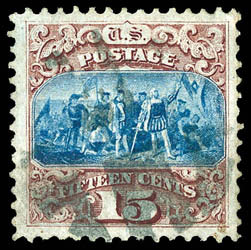 A SCARCE ORIGINAL GUM EXAMPLE OF THE 1869 15¢ TYPE I PICTORIAL ISSUE. 1869, 15¢ brown & blue, type I, neat geometric cork cancellation, strong bright colors, choice centering amid large well balanced margins, Extremely Fine, an attractive large-margin stamp; with 1998 and 2015 P.F. certificates, later Graded (XF 90, SSV $1,500). 1869, 15¢ brown & blue, type II, o.g., fairly light hinging, exceptionally fresh with rich vibrant color, wide margins and attractive centering, Very Fine and choice, a beautiful mint Pictorial issue; with 2014 P.F. Graded certificate (VF 80).